Hi Folks, Does anyone has the same issue to stream “say it right videos” without vpn connection. I´m using OS system/firefox web browser. Does anyone has a solution for this issue ? Usually my vpn tunnel works well but not for those videos. 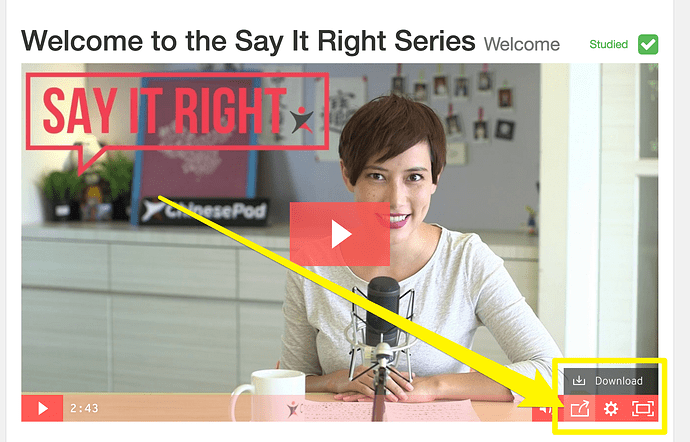 We use Wistia to embed videos since it’s not currently blocked in China, therefore you should not need a VPN to access it. That being said, we can’t always account for the day to day running of the internet there. Could you try again please. You could try right clicking on the video and watching it directly on Wistia. This might fix it. Just got the Premium annual subscription. I’m located in Central China. Currently located at a really nice Internet cafe with a good connection. These videos just don’t play. Either with or without VPN (ExpressVPN connecting to Hong Kong). Is there any chance you’ll consider hosting on Youku or something 国内 for those of us on the Mainland? A bit frustrating to have just dropped the cash for the annual subscription and then not be able to watch these videos. Thanks! @josephtosi After hearing that you had problems with the video embed with and without a VPN connection, we have taken steps to give an alternative solution. 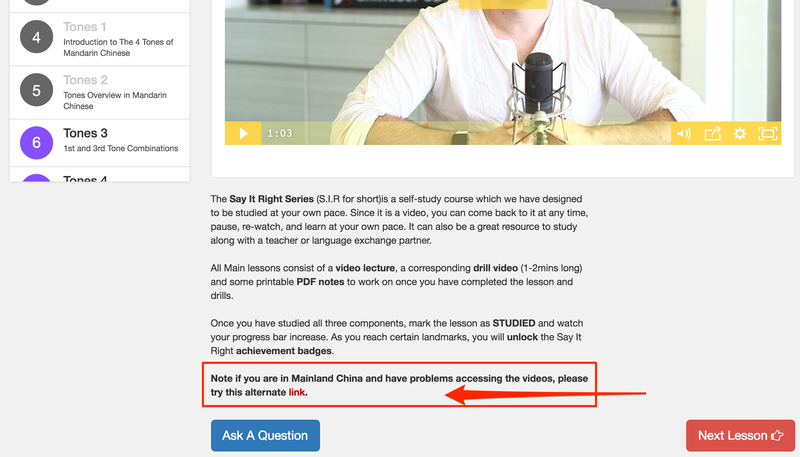 For users in the Mainland who can’t view the video lesson, there is a direct link to watch the video elsewhere. Hopefully, this alternative works instead. We tried using YouKu, but many of the videos get blocked before being published. I’m currently in Xinjiang and can’t access the Say It RIght video even via the mainland link provided. Any chance of getting it uploaded to YouKu? Edit: Just saw the comment that you tried YouKu. We are in the process of providing BaiDu Yun links instead. I’ll let you know once it’s done. Thank you for your patience. The alternative links should all go to Baidu cloud now. If you want to stream them, you seem to have to sign in (with baidu or QQ account), or you can download directly from the link without signing in. I am currently uploading to other video services like v.qq.com so see if we can improve the experience. Hi Gwilym, thanks for getting back to me. Sorry I haven’t replied, been traveling and just catching up. Will definitely give the videos a try. Wonder why they’re being blocked on YouKu, but thank you again! Oh, I see. So I’ll need to log into Baidu. Will try that.